We ask you to bless St Joseph's School Community. listen, speak and act like St Joseph. May we always keep Jesus at the centre of all we do. 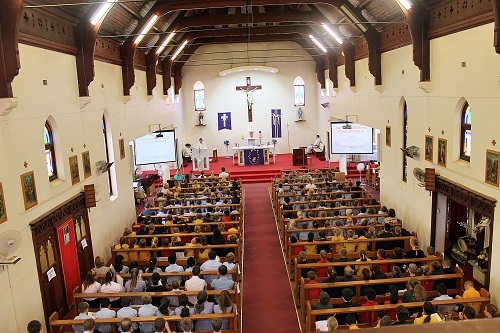 St Joseph’s Parish would like to advise that Children’s Liturgy sessions are held during the 8.00am Sunday Mass. 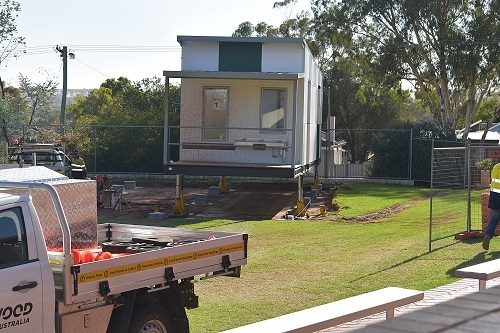 The installation of the new transportable classrooms at the Primary campus was quite a sight to behold last Friday. 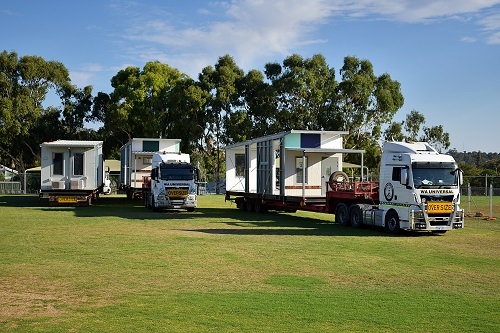 Six trucks, each with a piece of the building, worked in unison to line up the sections and lower them into place. This week, it has been a hive of activity as the building is correctly joined together, paving is going in and all the wiring for power, internet and security is installed. The children have loved seeing the developments every day. While all this was happening last Friday, staff were taking part in an informative Professional Development day on the topic of Trauma and its impact on education along with some sessions on personal wellbeing. Going home today with the students in Years 3, 5, 7 and 9 is an informational flyer detailing the NAPLAN tests for 2019. A copy of this flyer is attached. This year, all the testing will be online except the Year 3 Writing component, which will be done on paper. Children who meet the eligibility criteria for exemption will be contacted by either the Head of Primary or Head of Secondary to ask you to sign an exemption form. Those parents who wish to withdraw their children from all or some of the components of NAPLAN need to contact the School to request a Withdrawal Form. These must be submitted by Friday 12 April. 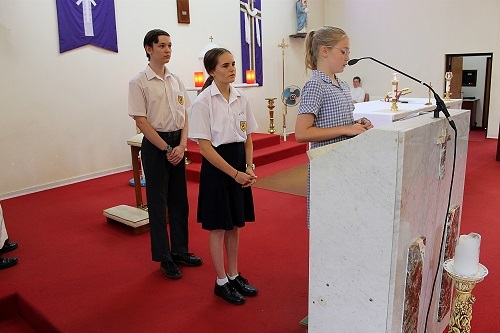 This week, we celebrated the Feast Day of St Joseph with a lovely whole School Mass. Thank you to Mr Reidy for his organisation and beautiful music. The children all spent some time together on the Secondary campus enjoying an icy pole after being in the warmth of the Church. The Inter-house Carnival last Thursday was a great success. Those students who attended had a great time and swam their hearts out. There are many thank yous that must be extended after an event such as this: to Ms Frost and Ms Suckling for their hours of preparations, to the many parents who gave their time on the night to help out, to the members of the P&F who kept us supplied in food all night and to the members of the Northam Swimming Club who helped in the running of the evening – a big thank you to you all! Full details are provided further in the newsletter. 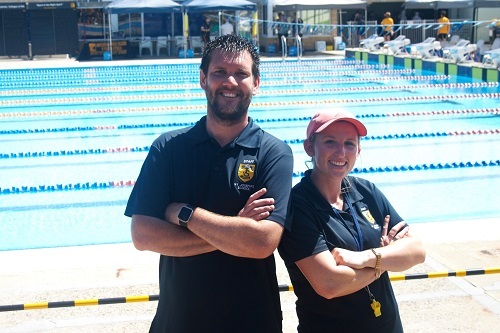 Ms Suckling and Mr Vernede took 45 students to represent St Joseph’s School at the ACC Interschool Swimming Carnival on Tuesday. We received some outstanding results, both individually and overall. Congratulations to all the swimmers. This morning, we were highly entertained by the Year 6 class as they shared with us a ‘real-life’ slide show of their exciting times at camp. It was lovely to hear about their exciting times and the lessons they learnt. This week, I was informed by Mr Selvam that as of the end of this term he will no longer be providing Butter Chicken as a lunch option to the Secondary campus on a Thursday. We thank Mr Selvam and his family for their delicious catering over the years. Beginning Term 2, The Hill Catering Company will be supplying food options to the Secondary campus twice a week. Students and staff will be able to purchase either Fried Rice or Spaghetti Bolognaise on a Tuesday and Butter Chicken on a Thursday. More details will follow at the end of the term. Ordering procedures for Secondary lunches will remain the same. Evangeline is strengthening Aboriginal culture, while making a living for herself and creating opportunities for her community. Featured in Project Compassion 2016 and 2018, Evangeline was employed by the Caritas Australia supported Djilpin Arts Aboriginal Corporation and quickly rose to the role of Senior Arts worker. This opportunity has helped me turn my life into something more positive. It makes me more confident and more independent." Her work at Djilpin Arts has supported the organisation’s growth from a multi-media project to a multi-level contemporary arts and culture centre. 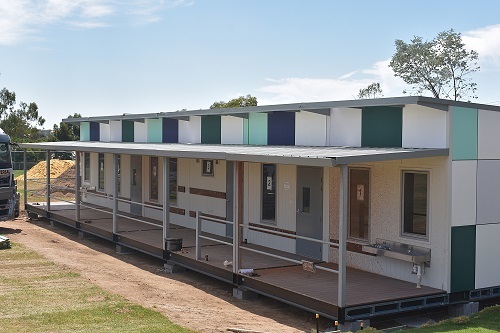 An example of excellence in Indigenous tourism, it’s now a key employer for young people in the remote Northern Territory community of Beswick (Wugularr). In 2018, Evangeline is busy guiding tourists, coordinating cultural activities and helping community members to practise and market their arts, such as weaving and jewellery-making. Evangeline’s career has flourished and she has become an inspirational youth leader. Please donate to Project Compassion 2019. Lives change when we all give 100%. Breakfast Club will operate on the Secondary Canteen on Wednesdays during Recess. There will be muffins, muesli bars and fruit available to purchase from the Secondary Canteen. Cost is $1 for two items. Students are asked to provide the correct change. All queries to be directed to Michelle Johnson on 9621 3565. A reminder is given to all parents/guardians and visitors that you must sign in at the Admin Office before engaging in any activity or if a student is picked up or dropped off outside normal school times. Parents are requested to arrive no earlier than 3:00pm [Mondays, Tuesdays, Wednesdays and Fridays] or 2:25pm [Thursdays] when collecting a student at the end of the day. Similarly, parents are expected to depart the school grounds in the morning at the ringing of the bell or when the siren goes. It can be disconcerting to a child adjusting to the new routine if they can hear their parents chatting outside their classroom. A reminder is given that the Primary Learning Journeys will take place on Thursday 4 April (Week 9) from 3:00–5:00pm. 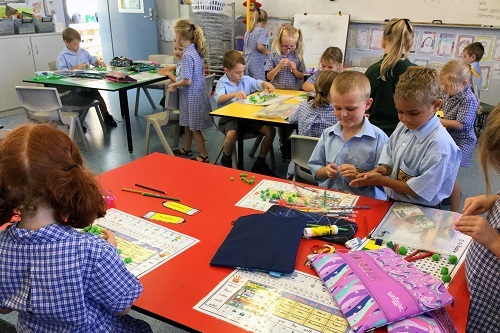 This is a wonderful opportunity for parents to visit their child’s classroom and spend time going through workbooks, participating in activities and touching base with the classroom teacher. Next Monday and Tuesday will see our Library transformed in the ‘World of Maths’. 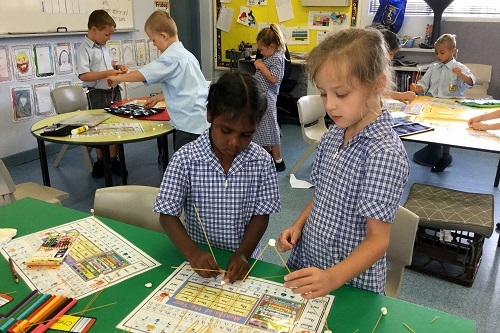 The ‘World of Maths’ Incursion is an interactive, hands-on problem-solving session designed for all students from Pre Primary to Year 6. 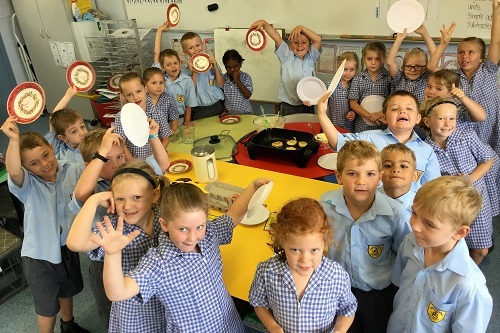 Year 1 Gold have had an awesome but busy start to the year. Things are just starting to settle down now after swimming lessons, and we are finding our feet in a lot of ways. In Religion we have been looking at Baptism and learnt about all the different things we would see at a Baptism. In English we have been learning to read and write recounts. Maths has seen us measuring lots of different things in all manner of ways. We have been making number lines and learning all about 3D shapes. Science has had us exploring changes and how things change. We explored why it is better to build a tower out of uncooked spaghetti, instead of using cooked spaghetti! Technologies has seen us exploring digital systems and using our own usernames and passwords to log onto the computers. We also enjoy using Teach Your Monster to Read during this time. During Art we have learnt lots of things about colour and texture, and had a great time exploring the school for different textures to create our own monsters. Year 1 Gold is awesome! We care for each other. We can’t wait to see what the rest of the year brings us! Most senior school students have settled well into their courses. A reminder is given that no further course changes can occur after Thursday 4 April 2019. After this date, students can only withdraw from a course, provided that they meet the requisite. Senior school students, Year 12’s in particular, must study the breadth and depth of a selection of courses. The WACE includes ATAR, General, Foundations, Preliminary and VET courses. To fulfil this requirement, no more than one study period a week is permitted. Years 10 - 12 students are reminded, that any course or ventures outside of school may be uploaded to SCSA for inclusion in their WASSA. Courses include: the Leeuwin Adventure, Outward Bound, Cadet leadership courses, Immersion programs, Duke of Edinburgh and any other such ventures. Reports will be posted out and available on SEQTA in Week 9. On Thursday in Week 10, interviews will take place. Please make sure you book your times as soon as possible. Students needing to leave the school grounds for appointments during the school day require a written note or email from their parents before they can leave the school grounds. Parents/guardians must sign them out and back in if returning after the appointment. There are many after-school activities happening on the Secondary Campus! You will see dedicated teachers tutoring in various senior school courses, homework sessions, Hobby Club, da Vinci Club, training for various sporting events and when required, Drama production rehearsals. Thank you to our Staff who gives up their time so our students can have a enriched educational experience. The Year 7’s have taken off to a flying start to Secondary Mathematics. The year started with consolidating content learnt in Year 6 with mental strategies in addition, subtraction, multiplication and division. We have now moved into learning about number patterns which is a precursor to the much misaligned Algebra. Test number two will be occurring next week assessing all that was learnt in Chapter 3 focusing on factors, multiples and number pattern. Rounding out the term is the topic on angles and vectors and finally, “Why shouldn’t you let mathematics intimidate you?” Because it is as easy as pi. This term, the Year 8 students have completed a section on Integers. This covered topics including directed numbers, indices, order of operations, factors, multiples and divisibility tests. Practical applications included grouping different lollies for bags for a shop. These skills would also be vital in designing a roster at a mine site to accommodate different shifts. This group is currently working on fractions, decimals and percentages. This includes when it is appropriate to use each type of number representation. The four operations have been covered using fractions and decimals. These skills will be tested without a calculator. Practical examples have looked how to calculate profits, losses, discounts and best buys in retails. Fraction skills are vital in cooking and other tasks that require mixing such as concreting. Course A – The first topic was Algebra and Indices. Algebra operations including simplifying, expanding, factorising and four operations using Algebraic fractions. These skills were covered both with and without the Classpad calculator. These are important for students doing ATAR Mathematics in Year 12. The Indices laws were also used and scientific notation for looking at the very large and the very small. Exponential and decay was studied and is useful for looking at bacteria multiplying or a rain water tank drip feeding a reticulation system. The current topic is Finance and it builds on the same topic last year. It also features heavily in all courses in Years 11 and 12 both in the ATAR and General stream. The sections have covered income, taxation, budgeting, investments, loans with both simple and compound interest. This topic is very practical and requires students to understand the terminology and how money is used in the broader world. Yr 10 Mathematics Course C is a project based course. We are looking into the application of mathematics in everyday life situations. This term we are doing a project about planning a holiday and budgeting. This project applies the four operations in decimals and fractions, converting measurements into other units of measurement, conversion of money into other currencies, estimating distances and researching flight bookings and hotel accommodation. This term, students are also doing mini tasks to revise for OLNA assessments by solving problems using the four operations, decimals, fractions, measurements, integers and interpreting graphs. Students will continue with their OLNA online revision sessions at least twice a week in preparation for their next OLNA assessment and will discuss any test questions they found difficult to answer. The course is approximately 50% test based and 50% assignment based. The course began with a review of key number skills. This included the order of operations, multiples, factors, writing out numbers in words and single digit addition, subtraction, multiplication and division. The foundations of Mathematics have been consolidated by a review of place value and how it applies to the algorithms of addition and subtraction. Single and multiple digit examples have been considered. Students have completed two tests on these skills. The assignments are called Practical Applications and the first one was based on setting up an internet trading business. Students researched products and performed addition and subtraction of the key information. Their findings were summarised into a letter that was addressed to a bank requesting additional money for their business. The course began with a review of number skills. This included fractions, decimals, percentages, indices, order of operations, multiples and factors. The first test was based on these skills. The second test was based on finical calculations such as conversions between discount, commission, retainers, profit, loss, GST, rates, best buys, fractions, decimals and percentages. These skills were also tested in the second test. The first practical application applied all these skills to business case that they analysed. The results were summarised into a letter that was presented to a financial institution requesting a loan for additional money to improve their cash flow for their business. This group have been enhancing material learnt last year in Year 10 Mathematics - developing concepts with financial and accounting mathematics examining interest, government benefits, superannuation and budgeting. The students have completed their first task, a test with calculator and non-calculator components very successfully. Next week, they will be moving into their second task; an investigation, which will develop areas of inflation, currency exchange, profit and loss statements with taxation implications through manipulating equations within a spread sheeting context. The first topic was further differentiation in the topic of Calculus. This covered rules such as the chain, product and quotient rule. These were applied to equations that were either polynomial, trigonometric or exponential in nature. The first test was on this section and included a practical example of when the tides allow you to tow and then dock a large Iron Ore carrier at pier in Dampier. The second assessment was an in-class investigation where students developed rules for sine, cosine and for Eulers’ number e. They then produced each rules derivative, again using sequences on their Classpad. The second topic has covered second derivative tests for concavity. This skill is then applied to curve sketching. Finally, it is used in optimisation problems in measurement and business. Practical applications of these skills solved by the students included how to minimise the surface are of a cylindrical metal can to save a business money in production and using a cost function to maximise the profits from production. For Semester One, Year 12 Mathematics Applications will be focusing on three units; Bivariate data analysis, growth and decay sequences, graphs and networks. So far, Term 1 has focused on the fundamental concepts in the statistical investigation process which involves collecting, analysing and interpreting data and how to communicate the results. Students have gained knowledge in constructing two-way frequency tables and observed associations between two categorical variables. Students are now able to construct a scatterplot, identify and interpret observed associations between two numerical variables in terms of direction, form and strength. Students can now demonstrate this both manually and by using the Classpad. In the last three weeks of this term, students will be investigating the concept of growth and decay using general and recursive sequences. Short videos: teaching the concepts that have been taught in class by the teacher. This means if a student is a bit unsure of a concept they can have a second or even third look at it in their own time. Walkthroughs: which require the students to take the required number of steps to solve the maths problem. They can’t proceed to the next step if the previous one is incorrect. These help students who want to rush to answers and are not patient enough to take the required steps to get to the correct answer. Widgets: which are interactive so they allow students to explore each concept with their own ideas. Scorchers: a game containing ten questions that are timed. Results are ranked first on their accuracy and second on their time. This let students compete against other students from their grade at the classroom, school, State, National and global level. Literacy Activities: that assists students with the mathematics key words for each topic. Enrichment work: is contained in resources for each section and at the end of each chapter. These give each topic greater depth and are value for students who complete their work quickly and accurately. Please note that Hotmaths, like the text book, always starts at an introductory level and progressively gets more difficult. This resource has been selected because it gives students access to the curriculum. Please get your children to demonstrate how to use it. 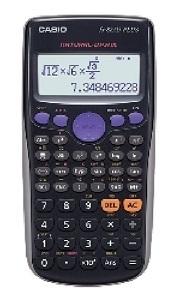 Currently all students required to purchase the Casio fx-82AU Plus II as detailed on the booklist. 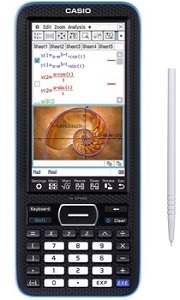 This calculator has many features and displays in the same notation that that is used on paper. The image shows that a fraction question is much clearer to read off the display than many other calculators. It important to note that tests can be structured as: Calculator, Non Calculator or a section of each. The examinations are split into a section of each. Good calculator skills can ensure students complete assessments quickly and can also be used to check their work. For these reasons, teachers routinely teach calculator skills to their classes. This facilitated by projecting the calculator emulation software on the whiteboards from their laptops. The Classpad calculator is required by students who are in ATAR Mathematics courses Application and Methods, plus those in Year 10 Course A. This unit has many features including: equation graphing, manipulating and solving algebra equations, geometry tools, differentiation, integration, advanced statistical calculations and financial problem solving. External examination time limits are set with good knowledge of this unit in mind. For this reason, teachers regularly teach skills with the unit using the emulation software. There are short tutorials that are posted on Teams as additional support for student. The picture above shows the Classpad performing an algebraic operation. Students dived into the year in Physical Education, starting off with swimming. Students in all years participated in swimming lessons and trials. 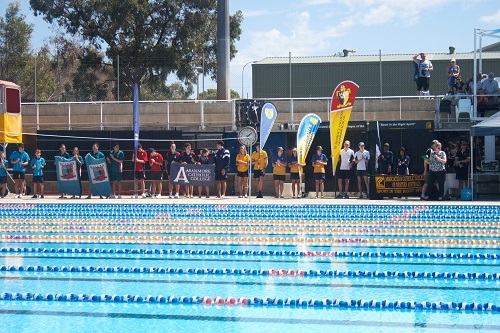 During swimming, the students developed their techniques in freestyle, breaststroke and backstroke, focussing on their stroke count and efficiency to improve their times for the swimming carnival. Year 7 students started Volleyball this week, hitting it off with some small sided games and practicing their ball control skills. 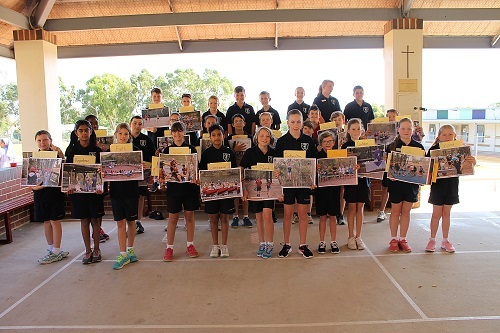 Students in Years 8, 9 and 10 all moved onto Athletics. High Jump, Shot Put, Javelin and Discus are just a few events they have experienced. 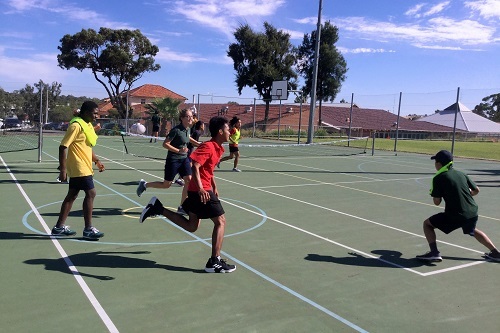 Students will be continuing with Athletics until the end of Term 1 and preparing for the Inter-house Athletics Carnival early in Term 2. It has been a great start to the year in PE and we can’t wait for more success and excitement in 2019. Students were introduced to the wide world of health, examining a variety of influences in our lives that impact on the way we feel and act. Year 7’s have explored their Identity, where they belong and who they are as young people in our community. Students have had the opportunity to explore what makes them unique and have handed in their first assignment. Year 8 Health students have developed a sense of entitlement as they explore the United Nations Convention on Children’s Rights and examine the importance of health relationships. Students have been very engaged and interested in learning all about the laws that protect them and the privileges they have living in Australia. Students have developed an understanding of the fine line between freedom of speech and discrimination. Year 9 Health have been looking at Body Image and the media’s influence. Students have explored the impact of media, advertising, social media and peer pressure on their body images. Year 10 students are looking at the impact of social determinants on our health and how population, location and access to facilities determine good health or bad health. Students have started investigating determinants such as stress, education, transport and food in a bid to understand how each of these factors can dictate a person’s health choices and a communities health status. Years 9 and 10 Outdoor Education students started 2019 analysing how to reduce their impact on the environment and sustain our outdoor environments for future generations. Students learnt how to apply the 7 principles of ‘Leave No Trace’ to activities such as orienteering, canoeing and mountain bike riding. Students then turned their attention to the skills needed to orienteer competitively and socially. Practising their compass and map skills in an urban orienteering environment, orienteering around the school. Students have been very enthusiastic and curious to learn these new skills to assist them while orienteering. All the students are very excited to get out and practise the orienteering skills at Northam Scout Hall early next term. 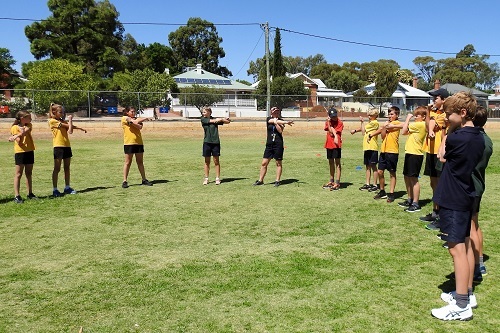 This Term, Year 9 Sports Science students have completed a variety of fitness tests and studied the components of fitness that these tests represent. Some of these tests have included the beep test for cardiorespiratory endurance, bouncing 2 basketballs test for coordination and dropping the ruler test for reaction time. The class has been learning skills to develop their gameplay in badminton and most students appear to be really enjoying playing a sport that was initially unfamiliar to many. Some highlights moving forward in the program include students creating and delivering warm-up sessions for the class as well as a coaching session at the Primary Campus. 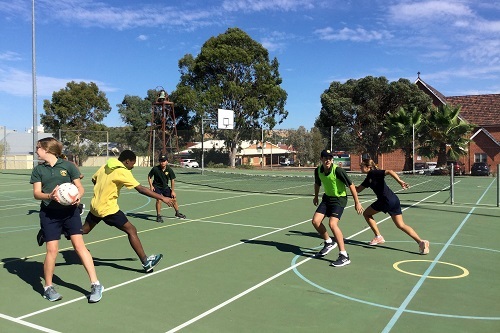 In Year 10 Sports Science, students have been studying the impact of environmental conditions and external factors on performance and the execution of strategies and tactics. The class has also had done some research into the protective equipment available for a variety of sports of their choice. Students have discovered what determines an athlete to be ‘skilled’ and classified skills according to distinct criteria on skill continuums. 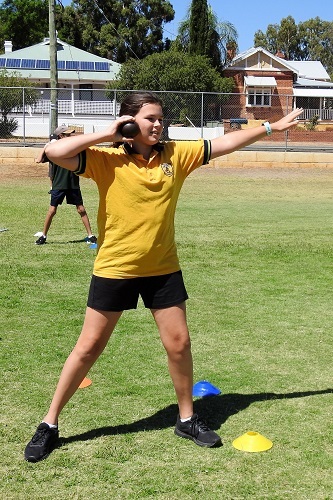 In practical lessons, student have focussed their attention to learning the skills of netball and developing gameplay. 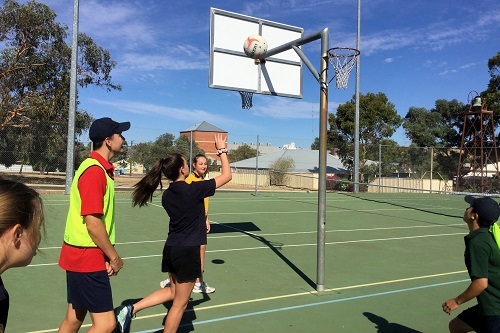 Both Years 11 and 12 Physical Education Studies classes are learning the skills of netball this Semester for the practical component of the course. Each skill is assessed according to a list of criteria that must be met as the skill is broken down into 3 phases: Preparation, Execution, Completion. The students in both classes continue to work on refining these skills to perform to the best of their ability in their practical examination at the end of the Semester. The Year 11 PE Studies class have completed the functional anatomy topic and are currently studying exercise physiology. As I write this, the key learning focus is about the relationship between the 3 energy systems (ATP-CP System, Lactic Acid System, Aerobic System). Other content recently covered has included energy source for exercise and discovery of the short-term (acute) responses and long-term (chronic) adaptations to training. The Year 12 PE Studies class have also completed the functional anatomy topic and are currently studying exercise physiology. This class are studying the effects of different environmental conditions (heat, cold, humidity, altitude) on the training strategies of athletes and these conditions have on performance. Students have also been studying the different nutritional considerations required at different phases of activity. On 12 March, four senior secondary Chemistry students attended the 2019 Royal Australian Chemical Institute (RACI) Bayliss Lecture at the University of WA. This lecture provides Chemistry students with the opportunity to see how that subject is applied in the real world within a specific industrial or research context. This year’s lecture was titled, ‘Breaking Bad down under’. The details of the talk, presented by a Forensic Scientist from the ChemCentre at Curtin University, who is actively engaged in ongoing Police investigations and research in the tracking and identification of clandestine drug laboratories. While the presentation was interesting and very informative, especially from the perspective of identification techniques, most of which are experiments developed and utilised for a range of different purposes in senior secondary Chemistry, it was a little disheartening how prevalent this backyard industry is in our modern society. The attending students found the discussions very relevant and will assist in providing context for various forms of laboratory testing, including spectroscopic analysis, precipitation reactions, organic chemistry and pH. “The Bayliss Youth Lecture this year provided a fantastic insight into the world of forensic chemistry, especially in regards to illicit drug-busting”. "Interesting insight into the arms race of ad-hoc backyard chemistry and the legislative process. It has demonstrated the ingenuity of desperation in numbers and highlighted the innovation of the analytical crew to remain one step ahead." "It was incredible to see the intelligence of those responsible for brewing such substances that provide toxic substances for elements of our society. It takes pure chemistry and incisive scientific investigation to crack these operations and mitigate the risks of illicit drugs and it was impressive to see the chemistry behind this in action”. 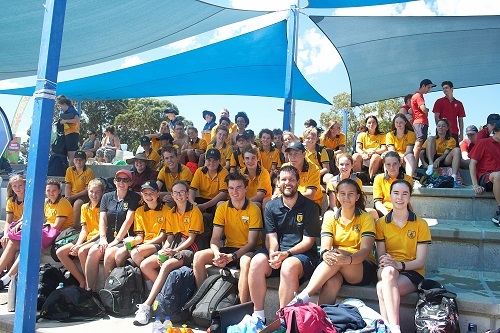 The annual swimming carnival is always a big sporting event at St Joseph’s School and the 2019 Inter-house Carnival did not disappoint. All the students who attended were in great spirits, showing off their new bay decorations, mascots and chants. Students really stepped up the competition this year with most of the champions only taking the win by a few points. Overall, it was a great evening - the students had a blast and it was great to see such great team spirit and sportsmanship from everyone involved. Thank you to Northam Swimming Club for giving up their time and equipment. The carnival would not run as smoothly without their help. Thank you also to all the parents who volunteered their time to help with swimming trials. Additionally, we would like to thank all the staff, parents and family members who assisted to make the night run smoothly. Congratulations to all the students who participated in swimming events and the champions for each year group. See attached table of results. 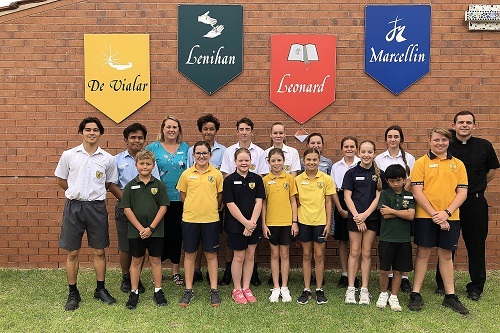 The results of Primary, Secondary and Overall House champions are still to be finalised after a very busy week of physical education classes and the ACC Swimming Carnival. The House champion results will be provided in next week’s newsletter. St Joseph’s Secondary ACC swim team spent the day on Tuesday 19 March at Mt Claremont. Following a full day of racing, our squad performed really well. The students all enjoyed themselves as the carnival had a great atmosphere and it was a lot of fun. St Joseph’s School came 5th overall, only 3 points behind 4th place and 27 points behind 1st placed. It was a very close competition! However, despite our squad’s efforts, we are not heading into A division. Individual achievements on the day were outstanding. We wish to congratulate William Humphries 3rd overall U/14 Champion, Coen Livingstone was 3rd overall U/15 Champion, Tess Lawrence was Champion Girl U/15 and Demi Hunt was Champion Girl Open Division (against Years 11 and 12 students). Well done to all members of our 2019 squad! Parents/Guardians who hold a Centrelink Family Health Care Card, Centrelink Pensioner Concession Card or Veterans’ Affairs Concession Card who have students in Years 7-12 can claim an allowance. Note: Card held must be current in first term of the school year. To apply for the scheme or to obtain more information, please arrange to see Mr Steve Johnson at the Primary Campus. Applications close 31 March 2019. The full year’s School fees have been posted. Unless you are paying by Direct Debit (DD) or another regular payment scheme, the School required payment of at least 1/3rd by Friday 22 March. Those parents on the HCC/PCC Scheme should contact the Primary Office as soon as possible so discounted fees could be calculated and the Secondary Assistance Scheme (SAS) Rebate claimed (if applicable). If you have missed this deadline, please arrange to speak with me as soon as practical. Thank you to everyone who assisted in some way with the catering at the recent Inter-house Swimming Carnival. It was a huge success both with the amount of volunteers who came forward but also financially for the Committee and the School. It was wonderful to see so many new faces lending a hand on the night, so again ‘Thank you’. Coming up we have our major event for the year, the Colour Explosion, being held on Friday 12 April. A note and sponsorship booklet was sent home last week to all students explaining what is involved and how to start raising funds. It wasn't quite explained clearly enough on the importance of setting up an online profile for each child in the family. This doesn't have to be public or shared, it is for the benefit of your child/ren. By setting up an online account, you can track the cash donations as well as any online (if you choose to share the link) but also ensures your child/ren will receive a prize at the end for all their efforts. If you have any concerns or have trouble doing this, please contact me via email: georgiahaddrill@gmail.com or mobile 0439 9429 33 and I will help you set it up. We are also running the very popular Easter Egg Raffle, starting Friday 5 April for the last week of term. This will be drawn on Thursday 11 April (prizes to be collected on the day of the Colour Run). Last year we put together 93 prizes for students across both campuses and was very well received by all. A percentage of money raised will be donated to our School's charity for this term which is Project Compassion. We hope to make up as many prizes as possible and are asking for any donations to come forward from now until the last week of term - please drop to either the Admin Offices or classrooms. Donations can be chocolate, colouring books, mugs, craft, baskets, bags, etc. etc. We appreciate your contributions and support. Next Friday 29 March, we will be hosting a morning tea for all Pre-Primary parents and caregivers. Please join us in the Primary meeting room from 8.45am for a cuppa and something to eat and meet some new parents. This is always a lovely morning and a great opportunity to make new friends! Hope to see you there. Lastly, our next meeting is on Thursday 4 April at 1.00pm in the Primary Library. This will be to finalise everything for the Colour Explosion and Easter Egg Raffle. Remember 'many hands make light work' . The Uniform Shop price list has now been updated. To see this, click on the 'Parent Information' tab, then on 'Uniform' in the left-hand menu. Scrolling down, you will see a small yellow PDF icon - click on the writing to the right of this and the latest price list will pop up. The Uniform Shop will not be open on Monday 25 March. Please note that the Shop will be open for parents to access or to process any orders on Thursday 28 March as usual. On Fridays for the remainder of Term 1, the Canteen will be offering Fish Fingers at 40c each. These are an optional extra available only during Lent. I would like to welcome all our families to the new school year. Please consider offering to work in the Canteen as without your generous support, we would not be able to provide this service to our School. The 2019 Summer Menu is available on the website and in each Primary classroom.